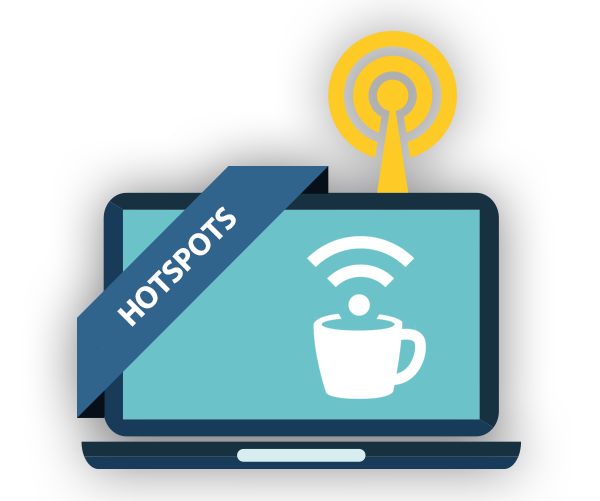 A Hotspot is a Wi-Fi access point (AP) where users are able to connect to the Internet, without owning any equipment, other than their Wi-Fi enabled device. Bronberg Connect public hotspots are positioned throughout the Pretoria where the public is able to access the Internet with pre-paid vouchers, your Bronberg Connect account or credit card. We also build private hotspots for clients who wish to control the access to their network. Restaurants, hotels and conference centers, guesthouses and Airbnb establishments, student accommodation and apartment buildings all make use of our private hotspot services. We consult, scope, build and manage these networks, on behalf of our clients, to ensure that the hotspot is always on. Chat to us about our revenue share models that require little to no capital investment. A Hotspot is a Wi-Fi access point (AP) where users are able to connect to the Internet, without owning any equipment, other than their Wi-Fi enabled device. Bronberg Connect public hotspots are positioned throughout the Garden Route where the public is able to access the Internet with pre-paid vouchers, your Bronberg Connect account or credit card. Fuss-free!